For the second year in a row, BrainLazy heeded the call and headed down to one of the biggest geek gatherings the East Coast has to offer, the New York Comic Con. It is a rare chance to join up with pop culture gurus and socially awkward dweebs and quietly convince ourselves we belong in Column A, not Column B. As usual, it didn’t disappoint, bringing us plenty of news in the only areas that matter: Games, Comics, Movies, and Assorted Nerdery. Let’s break it down and see what made Comic Con great this year, shall we? I fall into a weird niche in the world of comics. You see, while I am a comic book fan, I don’t have a favorite comic, and I don’t even read them that often. The last batch I read was a pile of Deadpool comics a while back. Thus, though it was awesome to be surrounded by such shining stars of artistry, I didn’t know who most of them were… and boy were there a lot of them. I’ve spent most of my life assuming that artistic talent was rare. That illusion is thoroughly shattered with one step into artists alley. It was wall to wall masters of the graphical arts, all hocking their wares. Now, I don’t consider myself an artist, but glancing around the legion of illustrators, I quickly realized how “not an artist” I am. One artist and animator I DO know is Bill Plympton. I’ve been a fan for a very long time, dating all the way back to when I knew his work exclusively as “those awesome cartoons on MTV.” My eagle-eyed associate Oriech spotted his “Plymptoons” table, so we decided to stop over. There was an array of art books and DVDs. Oddly, the only one I own, Mutant Aliens, wasn’t there. While we were checking out his products, someone walked over and stuck a hand out. “Hi, I’m Bill, by the way. Let me draw you a free picture.” That was my introduction to an artist I’ve admired my whole life. He’s a great guy, and he’s currently pushing his new film, Idiots and Angels. The simple fact that he created it had me interested, but printed across the top of the autographed ad-card he handed me was “Terry Gilliam presents…” That’s practically enough to give me a nerd-gasm. Check it out and, if it shows up in your area, see it. When we were lining up our press stuff, we got a notice about a special panel in which Stan Lee and Yoshiki would be making a huge announcement. Everybody knows Stan The Man, so even though I didn’t know who this Yoshiki guy was, we all figured it was worth RSVPing. It turns out, Yoshiki is kind of a big deal. I’m not talking about “famous”, or even “very famous”. I’m talking about “Bigger than Bruce Springsteen and the Beatles put together”. He’s the front man for X Japan, a group that sells out stadiums all over Asia. There were hundreds of people waiting in line, some having flown from Japan for the privilege of being in the same room with this guy. And there I was, standing at the front of the press line, feeling the combined hatred of several dozen Japanese girls as I was ushered to the front row. If utter, concentrated jealousy could kill, I’d be dead right now. As it is, I only have mild to moderate ear trauma from the piercing shouts of “Yosh-ki!” Evidently Japanese women call out to their music idols in the same way that they call out to their Pomeranians. Both Stan and Yoshiki were charismatic, even despite certain language problems. Stan couldn’t hear anything said over the microphone, and Yoshiki is fairly new to the English language. You can find the specifics in the videos below, but long story short, Stan and Yoshiki will be producing a motion comic starring, and featuring music composed by, Yoshiki. I learned a lot in the Q&A that followed, but my favorite little gem was when Yoshiki complained that Roseland Ballroom is a monster of a venue to pronounce if you are a native Japanese speaker. Good stuff. There was a strong gaming presence this year. At Sega’s booth we got a chance to see the new Thor game under development. It isn’t technically a tie-in with the movie. The story is much larger, and the scope is epic. Considering that you are playing as a literal god, it would have to be. You’ll be doing battles against massive demons and trolls using powers of three main types: hammer, thunder, and wind. The massive size of the enemies gave the footage we were seeing a distinctly “Shadow of the Colossus” feel, grappling and climbing up creatures to take them down. For gameplay reasons you won’t be playing with ALL of Thor’s many powers. Flight is limited, lest you just skip the whole level. The game will be released on all major platforms, with semi-realistic visuals for PS3 and 360, and comic inspired graphics on the Wii and DS. The developer estimated a playtime of about 10 hours. Also from Sega and Marvel was the upcoming Captain America: Super Soldier. There wasn’t anything specific to be said, but they did show us a trailer, which you can see below. I’ve always been a fan of the crazy ricochet stunts that Cap could do with his shield, and punching pseudo-nazi robots during WWII sounds like loads of fun to me. We hit Hudson’s booth, too, and saw a familiar face that hasn’t seen the light of day in a while, Bonk the Caveman. He’s starring in an upcoming XBLA title, Bonk: Brink of Extinction, which was playable. It looks to be 4 player, and in the mode we were able to get our hands on, the mood was distinctly competitive. Each player had a score multiplier that would tick up as they collected fruit and the like, and tick down when they got hit. Bonk has various… well, we’ll say various different heads that you can cycle through, each with different effects, but the level we managed to play was a water level, which didn’t give as deep a taste of the game’s various elements as we would have liked. The game is vaguely scheduled for a Fall release. Over at the Capcom booth, there was a lot to see as well. We also got a glimpse of Marvel vs Capcom 3, but again, seeing is believing. There was a tight cluster of people around the Megaman Universe kiosks, so I wasn’t able to glean an awful lot of pertenant info, but from the looks of it, you’ll be playing as the blue bomber as a stylized 3D character on a 3D environment, but the gamplay itself is 2D. Other Capcom characters make some appearances, too, with Ryu making a notable appearance in the trailer they showed us. Bizarrely, the goofy looking version of Megaman from the US box art showed up too. Call me intrigued. Continuing the retro theme, there was some playable GoldenEye 007 for the Wii, and it was in a section of the floor cleverly set up to look like the average living room right about when the original N64 masterpiece came out. Finally, there was a huge stage set up for Michael Jackson: The Experience. It looked like the Wii version was set up, and choice members of the crowd were brought on stage to go head to head to head to head, trying to imitate The King of Pop’s dance moves to the best of their ability. Only the position of the Wii Remote counted toward the dance accuracy, but you pretty much have to do the whole dance correctly in order to get it moving just right. It was actually kind of awesome to see a quartet of regular people (in crazy costumes) moving in unison, just like one of his videos. Technically, the scoreboard should have been the final word in who was the best dancer, but the MC put it up to the vote. And when a certain internet mascot made it up on stage… Well, see for yourself. Holy smokes, the costumes. I’m not sure if I should be upset that I’m enough of a geek to recognize so many of them, or not enough of a geek to recognize all of them. They say that a picture is worth a thousand words. Well, here is a veritable novel. There are certain things we encountered that don’t seem to fit into the other areas. One of them was the neat stuff you could buy. We met someone walking the floor who could make chainmail… FOR YOUR DOG! And of course there is the Mimobot folks we wrote about a few days back. We also got to see, up close, the creations of Nathan Sawaya. If you haven’t seen his stuff, then do yourself a favor and check out our shots. The things he does with Lego are nothing short of breathtaking. One of his pieces is Han Solo frozen in carbonite. Something about a scifi icon rendered in a childhood toy resulting in a video game-esque pixelated appearance managed strum every chord in my brain at once. 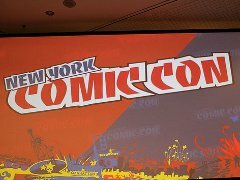 Not that it was a surprise, but NYCC easily lived up to my expectations. You can bet I’ll be making every attempt to go again next year.